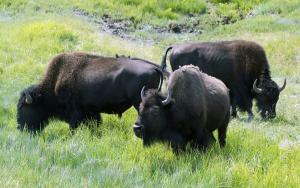 JUNEAU COUNTY, Wis., April 15 (UPI) — Police in Wisconsin warned that more than 100 buffalo had been seen running loose after escaping from their enclosure. Juneau county sheriff’s office shared a message to Facebook warning residents of the herd’s presence in the Union Center, Elroy and Wonewoc areas. Officers worked to contain the herd but cautioned pedestrians and drivers alike to keep away from the animals.